Perched on a southern tip of Western Australia’s coastline, Yallingup forms a part of the famous Margaret River region and is surrounded by the rugged and beautiful Leeuwin-Naturaliste National Park. 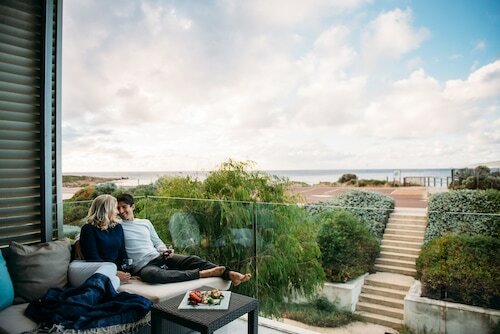 Nestled amongst trees by the seashore, Yallingup is home to gorgeous world-class surf beaches and dramatic caves, with wineries as its neighbours. Kelly Slater wannabe or not, Yallingup is beautiful, relaxing and adventurous all at once. 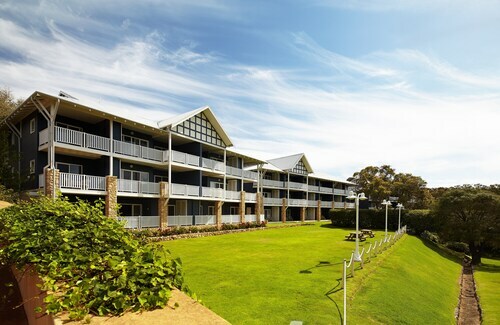 Browse our range of Yallingup accommodation today! A go-to destination for lovers and honeymooners since the early days, be grateful the journey is no longer a day-long horse and cart ride from nearby Busselton, plus the two days there by train from Perth. It was the discovery of the Ngilgi Cave (formerly Yallingup Cave) in 1899 that drew attention to the area, and as people flocked to explore the cave by candlelight, the town of Yallingup emerged beside it. Still now it’s one of the most popular attractions in the region! True to its name, Yallingup is an Aboriginal word that means ‘place of love’. Today, impeccable spa retreats and day spas fill the area, so pampering and indulgence is easy to come by for weary travellers and those looking to escape the daily grind. The spectacular scenery on offer is impossible to resist. From the calm waters of Geographe Bay to the massive surf breaks along Yallingup’s beaches, the sand glows white and the water shines crystal blue; there’s a perfect spot for surfing, swimming, fishing and snorkelling. Toes going wrinkly? Air them out with a wander through the delightful shops of Yallingup, from boutiques to local arts and crafts shops, and surf shops. There’s a host of other activities to fill your days, all within easy reach of town by car. Traipse along all or part of the 135km-long Cape to Cape Track. Winding along the coast and seaside cliffs, this is the best way to see Leeuwin-Naturaliste National Park. If you’d rather cheat and skip straight to the highlights, then take a drive to the Cape Leeuwin and Cape Naturaliste Lighthouses. For those who prefer to eat more than move, the plethora of world-class Margaret River wineries on your doorstep grant you access to not only amazing wine, but great gourmet foods too. Where else in the world can you knock on a cellar door that’s just five minutes from the beach? Is art more your thing? You’re in the right spot! Yallingup is home to the most galleries in the entire region. Yallingup is just a three-hour drive from Perth or 40 minutes north of the Margaret River township. Once you’re here, you’ll be mesmerised by some of the most diverse, spectacular and unique natural surroundings in the state. So snap to it and get to booking that Yallingup hotel! How Much is a Hotel Room in Yallingup? Hotels in Yallingup start at AU$145 per night. Prices and availability subject to change. Additional terms may apply. Loved our stay, very clean, beautiful gardens, easy 5-10 min walk to beach. Could hear kids running in the apartment above us but we would return to stay at Seashells without a doubt. Beautiful room , quiet close to nature location. And an old colonial style. Perfect.